“Florence Foster Jenkins” is based on the true story of a tone-deaf and eccentric 1930’s Manhattan socialite whose lifelong goal is to sing at Carnegie Hall. The film is yet another showcase for the perfection we’ve come to take for granted from — using her 20th Academy Award nomination (by far the most for any actor) for this performance as a quantitative gauge — the greatest actor in the history of film, Meryl Streep. Streep, as always, is brilliantly nuanced, authentic and engaging as the title character. Simon Helberg (from TV’s The Big Bang Theory and himself a professional pianist), as Florence’s accompanist Cosmé McMoon, almost steals the film as the character the audience most connects with. His reaction to the first time he hears Florence sing is by itself reason enough to watch the film. His character has the most dimension and it’s a treat to watch someone actually playing piano in a film and doing it commandingly and with flair, which is how he handles all the demands of his role. Hugh Grant, as Florence’s open-marriage husband St. Claire Bayfield, reportedly came out of semi-retirement to work with Streep. Because of age-defying actors who also got their start in the 1980’s like Tom Cruise and Brad Pitt, it was surprising and distracting to see how much Grant has aged since I last saw him on film. As I watched, I thought they’d have done better by casting Seth Meyers doing his Hugh Grant impression instead. I like period pieces so I enjoyed the cars, settings and Oscar-nominated costumes depicting the era. I generally don’t notice wardrobe too much but Streep’s costumes are so elaborate they’re like looking at parade floats. 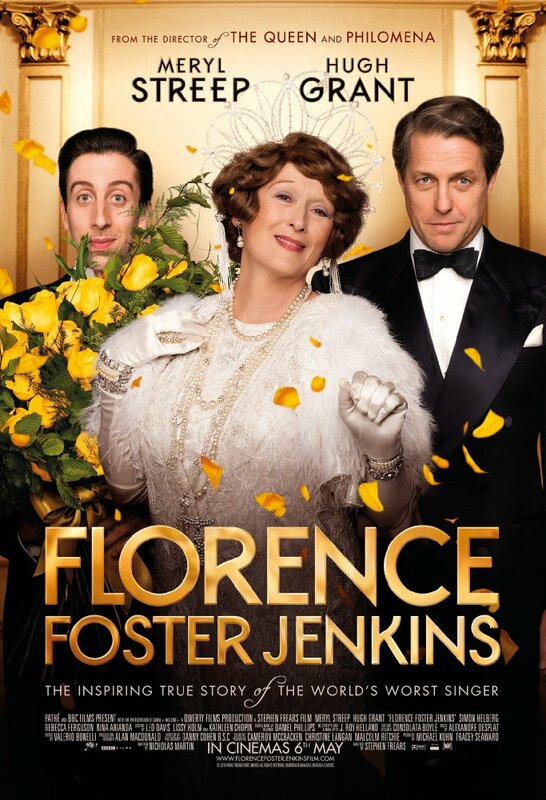 Directed by Stephen Frears (“Dangerous Liaisons”, “The Grifters”, “The Queen”), “Florence Foster Jenkins” is watchable if not great, Streep is flamboyant perfection and Helberg gives more to the role than it gives to him. I don’t understand the success of The Big Bang Theory but, based on his performance here, I’m looking forward to Helberg’s future big screen appearances. Does anyone else find it superhuman that Streep maintains her physical youthfulness the way she does? Contrast how great she looks with her contemporary and several times co-star (1978’s”The Deer Hunter”, 1984’s “Falling in Love”, 1996’s “Marvin’s Room”) Robert DeNiro, who doesn’t resemble his “Godfather II” self at all. That doesn’t take away from his greatness as actor; his choice of role-after-role in bad movies is another thing entirely. As of February 20, 2017, IMDB ceased its message boards, which was more than half its value. I can’t complain, though. It’s not like I pay for using the site. Still, it’s the end of an era and I’m not sure where to find such a great source of other viewers’ opinions on movies, which were often not only enlightening but hilarious. 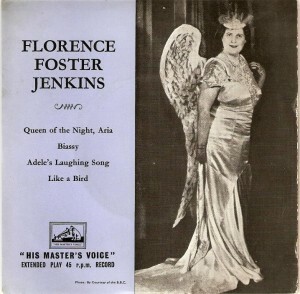 I just came across the 2015 film “Marguerite”, whose fictional story line is based on the story of Florence Foster Jenkins but it set in 1920’s Paris. It was released in the U.S. in 2016. Basically, two movies about a women from 80 years ago came out during the same year.